Yesterday I was at Gunderland, the rural Rolfe, Iowa, farm where I was raised. Harvest there is just around the corner. I hope you will click on these photos to magnify the detail, especially the photo immediately above. 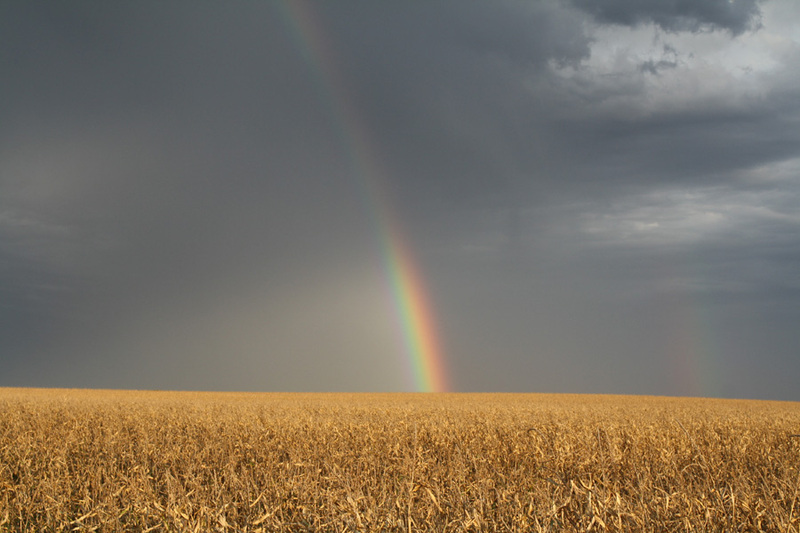 On my drive home I saw this double rainbow southeast of Rolfe, somewhere between Manson and Knierim. You might need to actually click on the photo to see the faint second rainbow. I didn’t notice, until I clicked on the link in this paragraph’s first sentence, that in the second (small) rainbow, the colors mirror the order of those in the larger rainbow. If you live in the Midwest, these green and golden corn stalks at Gunderland are similar to your everyday view. 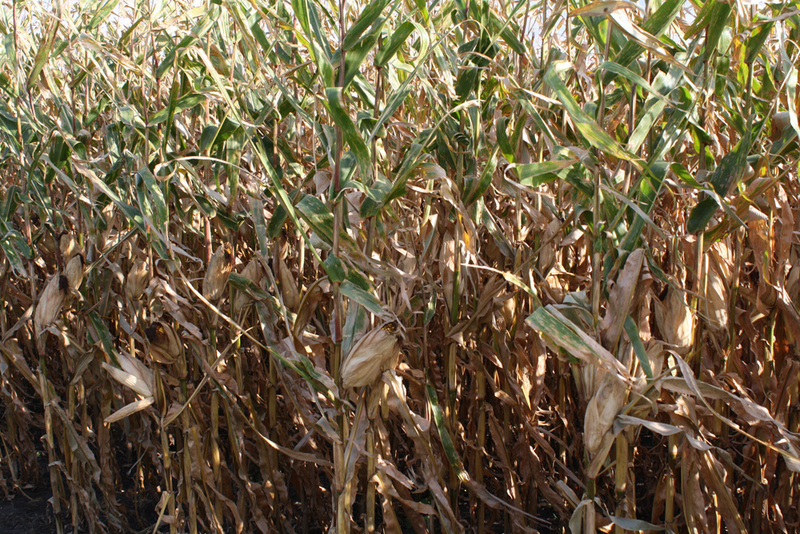 For those of you living in other regions, this September 13th photo gives a visual that harvest is near, if not already started in some areas. 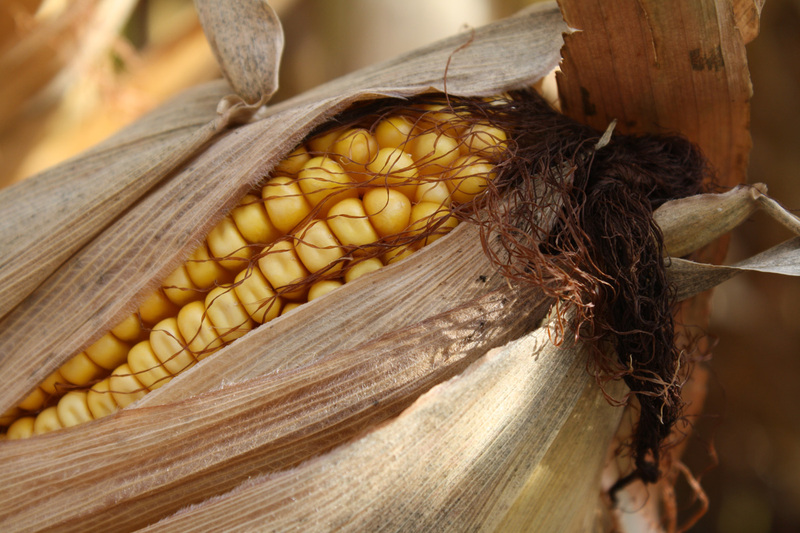 Today is the first day for the ear-of-corn header for this blog. I messed around with the text color, never finding what I thought seemed just right. I asked my grandson what he thought of the text color, to which he offered his advice saying, “The name [the text] is the same color of the corn, so you should leave it that way.” So, I will! This entry was posted on September 14, 2010 at 3:20 pm and is filed under Uncategorized. You can follow any responses to this entry through the RSS 2.0 feed. You can skip to the end and leave a response. Pinging is currently not allowed. Just drove through Knierim ourselves yesterday, on our way to an 8th grade football game. It’s a small world….at least up in this corner of the state, anyway. I can honestly say that I’d never gone to Gowrie the way Gus and Phil directed me. Of course, they were interested in bins and combines and all things farming along the way. I was mostly interested in making sure they knew where they were going and that we’d get to Mitch’s game on time. We did. Jana and Kelsey met us there to watch Mitch and deliver a birthday cake Kelsey had made for me. Yum! When we got home, Phil enjoyed some soup and Bill Cosby with us, because his house was full of PEO ladies. And of course we all know that stands for “Papa Eats Out”…or so they think. I think Jackson has an eye for design…passed down to him from his Great-Grandma Marion. And I’m sure he must have an interest in farming, like his Great-Grandpa Dean and his Grandpa Bill. And I’m certain his Grandma Louise keeps him well supplied withr reading materials, too. Louise, the photos are exquisite! Worthy of blowing up and framing and exhibiting. Nancy, I can so identify with driving off the beaten path to a destination. Daddy seemed to always have unique routes to get to any place I ever drove in the state. I still have maps he’s drawn and drive some of his routes when in Iowa. Beautiful! The banner; the first photo; the rainbows (which I never realized mirrored each other) above the golden corn; the education of the third photo; the little window into Mr. Jackson’s world! 🙂 A definite forward to my gang. Thank you, Marti and Peggy. You and the rest of the commenters are like my blog cheerleaders! What fun to read your comments. Marti: That is so nice of you to use the word “exquisite.” I kinda feel that way, too, especially for the photo of the ear of corn. It’s fun to know others enjoy it. And, as far as your maps that Daddy would draw, isn’t it just so fun to have his creations/handwriting?!!! I don’t have any of his maps (maybe because I live in Iowa?) but every time I run across something of his handwriting, I get a little wilty but am so glad to have the treasure. Peggy: I’m glad you like the banner and the photos…and Jackson’s helpful comment! : ) Until I read your comment, I had almost forgotten that Jackson helped me out with the font color. Maybe he’ll pick up your and Marti’s and Mother’s artistic abilities!